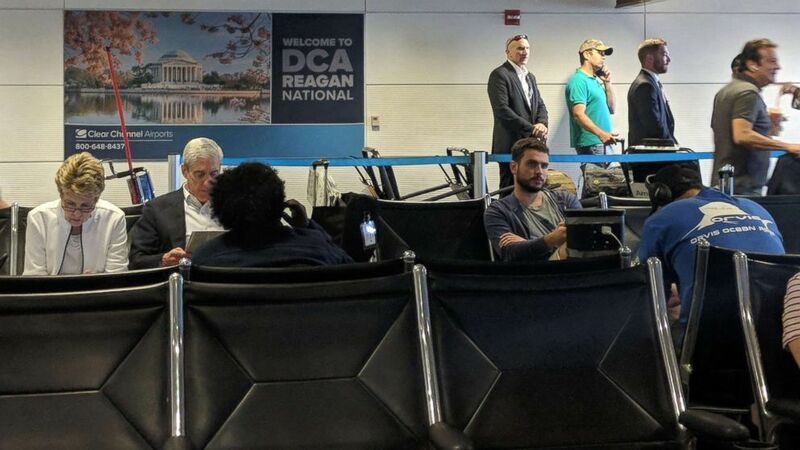 The president's son and the special counsel were seen at Reagan National. This could be a bumpy ride. Special Counsel Robert Mueller and the president’s son, Donald Trump Jr., shared more than just turbulent headlines Friday morning -- they also appeared to be in pretty close quarters at Reagan National Airport. The two were spotted Friday nearby each other waiting to catch a plane out of Washington in a picture first published by Politico. (Politico) Robert Mueller and Donald Trump Jr. wait at Reagan National Airport outside Washington, D.C., July 27, 2018. Politico did not say who snapped the photo, but noted that it was taken at gate 35X. In the pic, Mueller appears to be perusing a newspaper in the photo. "That is Mr. Mueller, waiting to board a flight," the special counsel's office said in a statement. "If it’s accurate that the other person in the photo was Donald Trump Jr., Mr. Mueller was not aware of him and had no interaction with him." While it's unclear what headline he was mulling over as he sat at his gate this morning, much of America was busy digesting a recent claim from the president’s former personal lawyer, Michael Cohen, about the controversial Trump Tower meeting that Trump Jr. participated in during the 2016 presidential race. 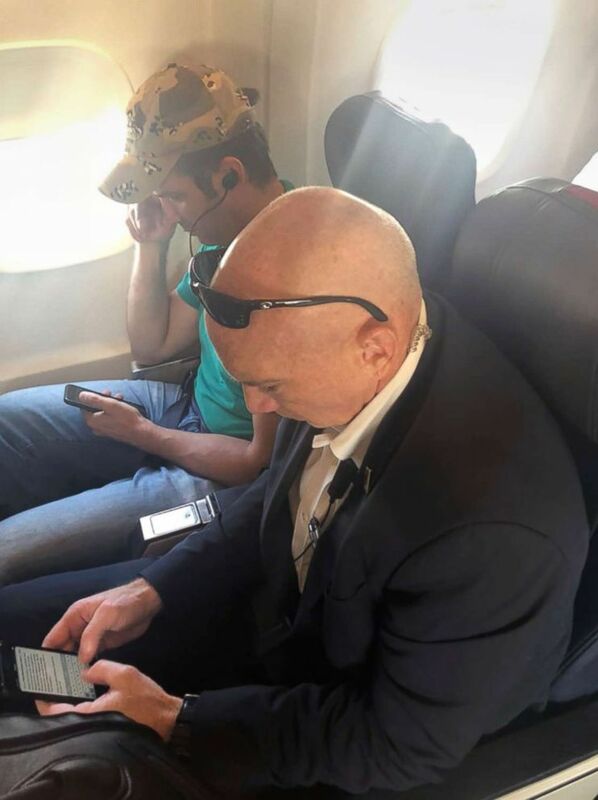 (Obtained by ABC News) Donald Trump Jr. seated near the window on a flight to Westchester, N.Y., July 27, 2018. Cohen made waves last night when reports surfaced that he claimed the president knew in advance about the meeting two years ago, when his father was a candidate for president, between Trump Jr., Jared Kushner, other Trump associates and Russian officials who claimed to have dirt on then Democratic-nominee Hillary Clinton. Trump has repeatedly denied any knowledge of the meeting, which has come under scrutiny from the special counsel's office. Trump Jr. initially claimed that the meeting was brief and had to do with adoption, but emails later revealed that he was promised dirt on Hillary Clinton. Trump lashed out in response to Cohen’s claim Friday morning, denying again that he knew in advance of the meeting. That is Mr. Mueller, waiting to board a flight. If it’s accurate that the other person in the photo was Donald Trump Jr., Mr. Mueller was not aware of him and had no interaction with him. Trump Jr. has not been questioned as part of the ongoing Russia investigation. He has however answered questions about the meeting before both the House and Senate intelligence committee and the senate judiciary committee.